Fig. 3.86 A pigmented polyp may be a malignant melanoma. Prognosis when radiotherapy is followed by maxillectomy is quite good for an early maxillary carcinoma, but poor when there is extensive invasion. 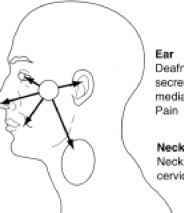 Exenteration of the orbit with maxillectomy is necessary when the base of the skull is involved. The use of cytotoxic drugs results in regression in some of these paranasal sinus neoplasms and is a further line of treatment. Extension of a neoplasm superiorly into the anterior cranial fossa involves resection superiorly of the dura and involved frontal lobe of the brain in continuity with the nasal and sinus neoplasms (cranio-facial resection). Fig. 3.87 Carcinoma of the antrum or ethmoid. These may extend not only into the nasal fossa and cheek (a, arrow), but may present in the oral cavity (b, arrow), appearing as a dental lesion. Fig. 3.88 Basal cell carcinoma of the nose. One should be suspicious of an apparently innocent but chronic skin lesion (arrow) which slowly increases in size and may bleed. Excision with a good margin is curative (see p. 107). 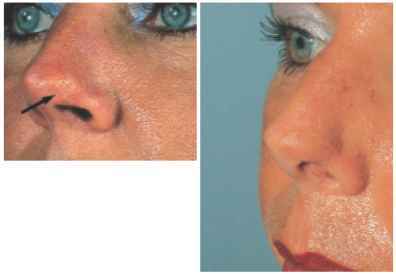 If, however, these lesions are ignored—and frequently they are disguised with cosmetics for months and even years—their excision can present considerable problems of reconstruction to avoid deformity in such an obvious site as the region of the nasal tip. Fig. 3.89 Repair following excision of nasal tip basal cell carcinoma. A large defect may remain in an obvious site (a, arrow). 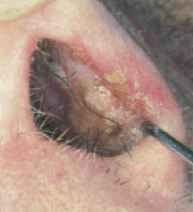 In this instance, a composite graft (a graft of two or three tissue layers) taken from the cartilage and skin of the ear was used as a free graft to repair the nasal tip (b). Basal cell carcinomas in the groove at the base of the alae tend to erode deeply. Radiotherapy is the alternative treatment to surgery, and with modern super-voltage therapy, lesions overlying cartilages can be treated with minimal risk of peri-chondritis. Fig. 3.90 Carcinoma of the nose. a The apex of the nasal vestibule must be examined extremely carefully in a case of scanty epistaxis, where no obvious bleeding site is apparent in Little's area. Minimal bleeding and occasional serosanguineous discharge were this patient's presenting complaints. 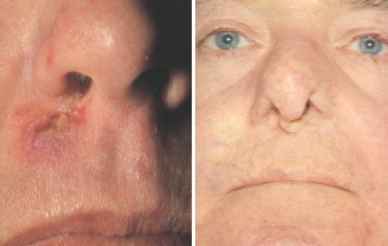 Later, the carcinoma became obvious, having eroded through the skin of the dorsum of the nose. b Wide surgical excision with forehead reconstruction rhinoplasty or, less commonly, radiotherapy, are the available treatments. Fig. 3.91 Carcinoma of the septum and coiumeiia. Fig. 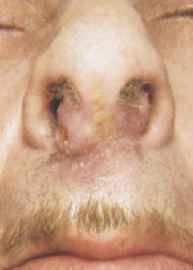 3.93 Carcinoma of the nasal septum. 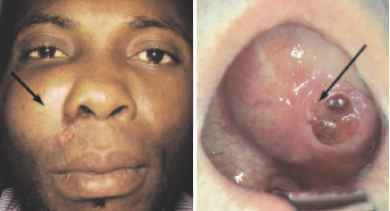 A biopsy of this ulcer on the septum and columella, which presented with scanty epistaxis, confirmed squa-mous cell carcinoma. Fig. 3.92 Squamous cell carcinoma of the nasal vestibule. The history was short, and the differential diagnosis of a basal cell carcinoma was made at biopsy. Fig. 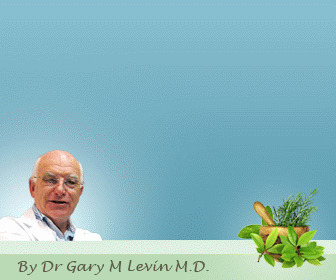 3.94 Chronic inflammation of the nose. Lupus vulgaris is now rare. 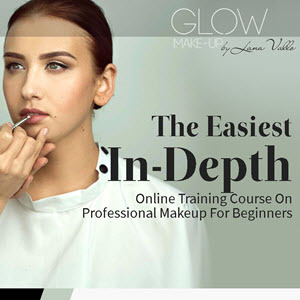 It presents as a chronic ulcer of the nasal vestibule extending onto the face. 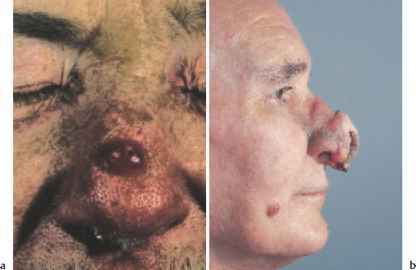 The differential diagnosis of inflammatory ulceration anteriorly in the nose includes sarcoidosis, which may also cause destruction of the ala. Biopsy is necessary for the diagnosis. Fig. 3.95 The effects of lupus vulgaris. Lupus, if ignored, is destructive to the skin and cartilage of the alae nasi and septum. Fig. 3.96 Carcinoma of the postnasal space (nasopharynx). This is uncommon in most countries, but has an unexplained high incidence in the Far East (particularly China) and East Africa. There are many presenting symptoms. 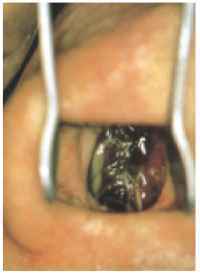 As the posterior choanae are large, nasal obstruction is not common with ulcerated carcinomas, which tend to present with symptoms of nerve involvement or otitis media with effusion due to interference with the eustachian tube. Lymphosarcomas and papuliferous carcinomas, however, cause obstruction. Carcinoma invades the skull base, involving nerves V, VI, and the Vidian (pterygoid) nerve, and may cause headache by invasion of the dura. The nasopharynx is a relatively concealed site, and presentation of carcinoma is commonly late, with a cervical node metastasis. The treatment is with radiotherapy. The overall prognosis is not good, with about a 30% five-year survival rate. This is, however, mainly related to the late diagnosis. 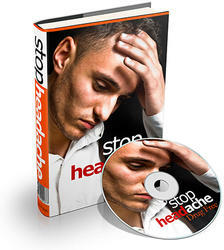 An awareness of the early presenting symptoms and signs is essential for improved prognosis. Fig. 3.97 Carcinoma of the postnasal space, presenting with a metastatic cervical lymph node (arrow). Fig. 3.98 Carcinoma of the postnasal space. A photograph through the fiberoptic endoscope gives a clear view of this postnasal space carcinoma. The biopsy forceps also introduced through the anterior nares can be seen. Therefore, biopsy of a postnasal carcinoma can be carried out as an outpatient procedure under local anesthetic, using the fiberoptic endoscope. Prior to the introduction of this instrument, the postnasal space was a "hidden" site, as this area cannot always be seen with mirror examination (see Fig. 1.48). General anesthesia was necessary for a thorough examination and biopsy. Fig. 3.99 Carcinoma of the postnasal space (a, arrow) seen well with the endoscope adjacent to the eustachian cushion. 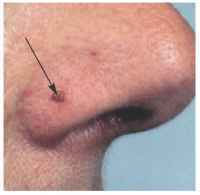 Some bleeding shows the site of a biopsy of the postnasal carcinoma taken via the endoscope (b).